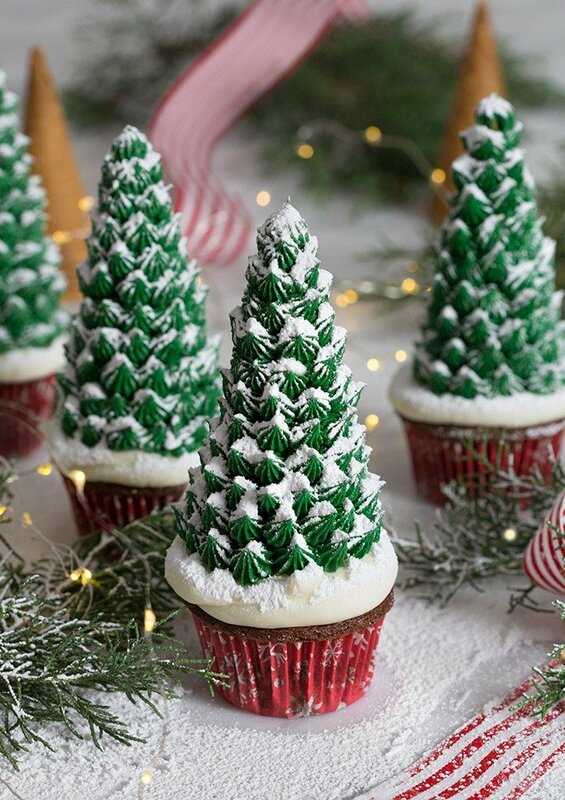 What could be more festive than little Christmas tree cupcakes? I think they look pretty good but the surprising part was HOW EASY it was to make them! You basically just pipe little star-shaped dollops onto a sugar cone with a number 30 tip. Any small star tip will do a good job really and if you don’t have any of those just use a leaf tip! For an added surprise try adding some candy in the cone before applying it to the cupcake. Each cupcake can have a different surprise inside, no coal though! 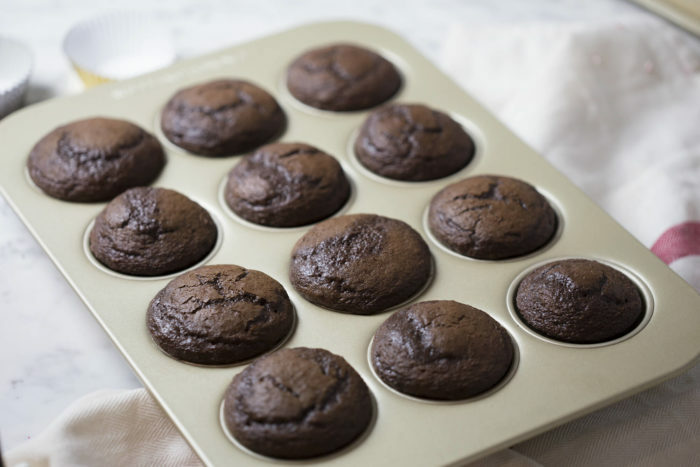 Use an ice cream scoop to get an even amount of batter NEATLY into each cupcake paper. You can see that the frosting applied to the cone is just a rough coat. It helps the dollops you apply adhere to the surface and prevents you from seeing any of the ice cream cone through gaps in your buttercream dollops. Just allow the cupcakes to cool fully before applying the frosting. And by the by, these are so rich and moist, you might be making them all year round! I really loved how the white frosting on the bottom looks like snow. A nice dusting of powdered sugar brings it all together. For the cake; pre-heat the oven to 350 degrees and add paper liners to a cupcake tin. Cream the butter and sugar until it is light and fluffy then go ahead and sift the remaining dry ingredients together in a separate bowl. Whisk together the milk, vanilla, eggs, and sour cream in a small bowl. Now add the dry mixture to the creamed butter in three batches alternating with the milk/ sour cream mixture while the mixer is running on low. Mix everything together just until it’s combined. 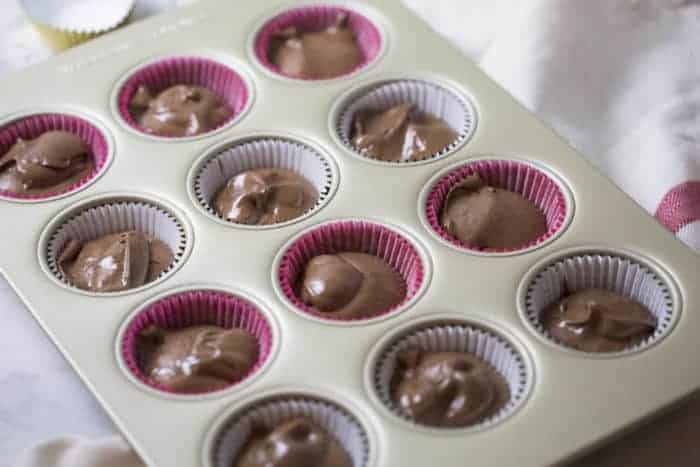 Once your batter is ready, scoop about three tablespoons into each cupcake liner. (I used an ice cream scooper). Bake the cupcakes at 350 degrees for about 15-20 minutes or until the centers are set and a toothpick inserted in the middle comes out clean. For the frosting; cream the butter first then add the sugar and mix on high. Once that is nice and creamed up, add the milk a tablespoon at a time until the desired consistency is reached. In a separate bowl, add about half of the frosting and the green food coloring and mix until combined. 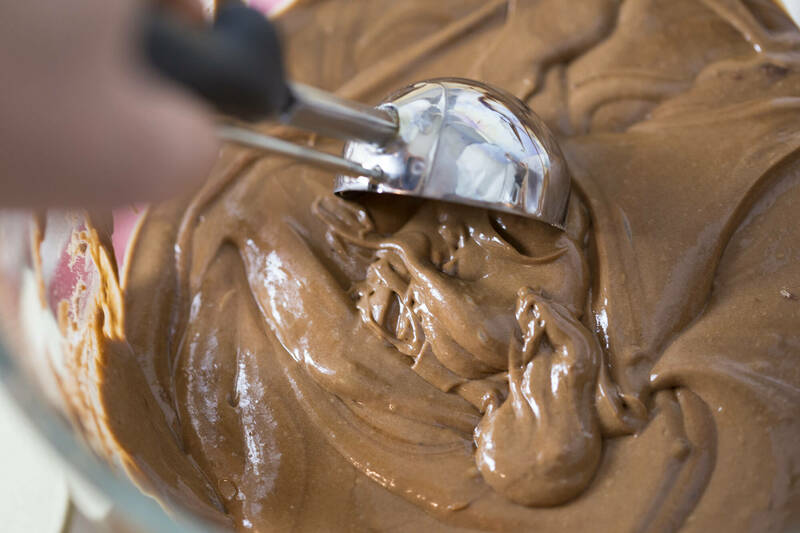 Use a spatula to apply a thin layer of green buttercream to the surface of the ice cream cone. This will help the dollops you apply stick to the cone better as well as making the trees completely green. (In case your dollops don’t give full coverage). Cover the cupcake in white frosting. It doesn’t have to be smooth. A bit of texture will make it look more like snow! Place the cone onto the cupcake and adjust as needed. Use a number 30 tip to pipe star-shaped dollops onto the surface of the cone beginning at the bottom and working to the top. 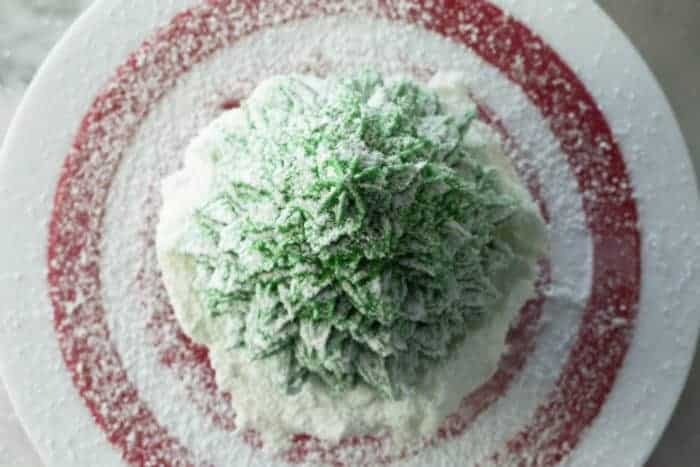 Add the desired amount of snow by sifting confectioners sugar onto the cupcake and it’s ready to serve! Sift the dry ingredients, including sugar, together in a bowl. Whisk together the milk, vanilla, eggs and sour cream in a small bowl. You can add in 1/2 cup of melted butter for extra rich cupcakes but it's not a must. Add the dry mixture to the milk/sour cream mixture while the mixer is running on low. Mix for a minute or less. Scoop about three tablespoons for each cupcake. Bake at 350 for about 15-20 minutes or until the center is set. Cream the butter. Add the sugar and mix on high. Add the milk a tablespoon at a time until desired consistency is reached. In a separate bowl add about half of the frosting and the green food coloring, mix until combined. Cover the cupcake in white frosting. 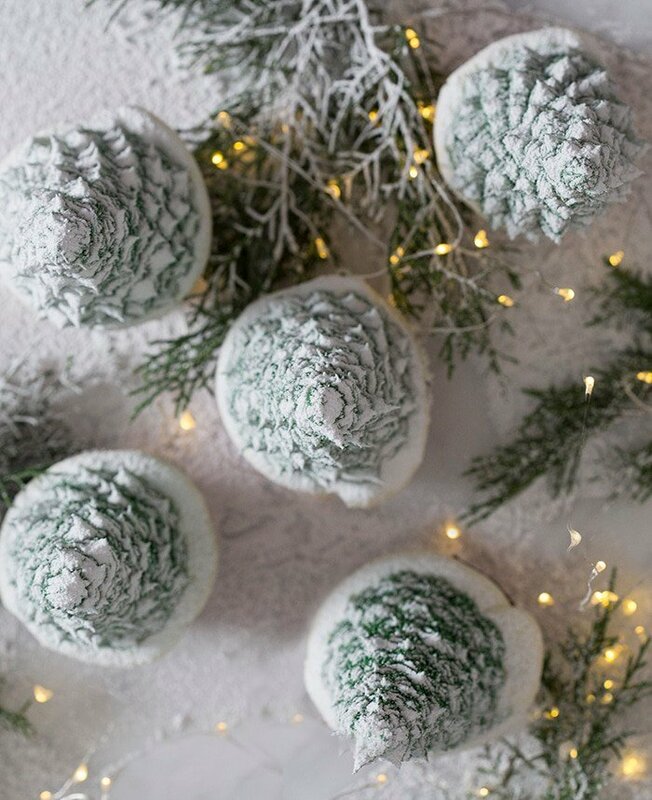 It doesn't have to be smooth, a bit of texture will make it look more like snow. 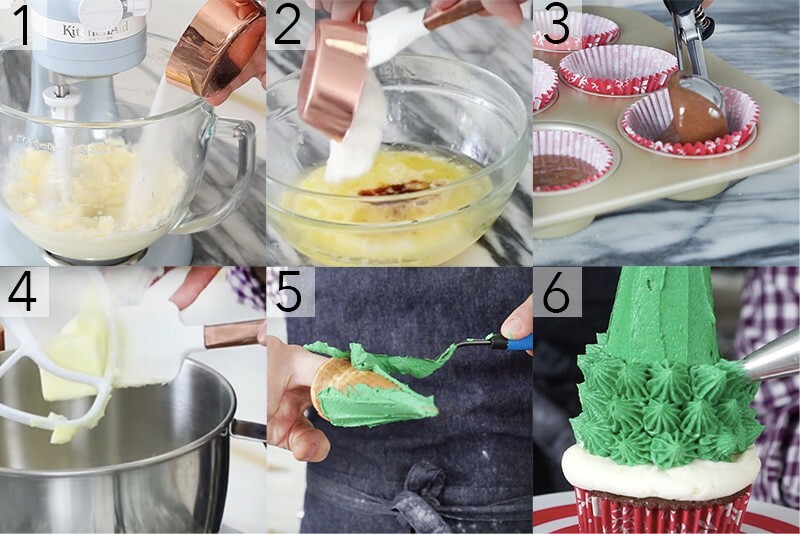 Use a spatula to apply a thin layer of green buttercream to the surface of the cone. This will help the dollops you apply stick to the cone better as well as making the trees totally green (in case your dollops don't give full coverage). Sift confectioners' sugar onto the cupcake and it's ready to serve! I added a half teaspoon of instant espresso because it brings out the chocolate flavor, you could also add half a teaspoon of peppermint oil if you wanted to bring out a more festive note. For an added surprise try adding some candy in the cone before applying it to the cupcake. Each cupcake can have a different surprise inside, co coal though! I like to give a really good dusting of powdered sugar "snow" to the trees for some added realism and dept. Hi Jamie — I’m sorry your cake didn’t bake without the addition of eggs. 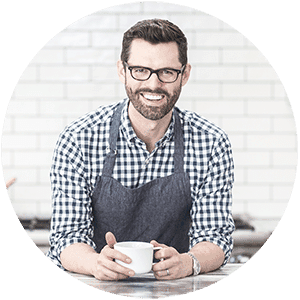 Please let me know if you take another stab at the recipe. Thanks, John. Those are awesome! I’m so lazy I dont think i could make more than one of them. This would be even more amazing if the cone was filled with something, like maybe marshmallow crepe. Don’t you think? Wow those look amazing! We love Christmas cupcakes! Yes, the icing will stay on the trees! Enjoy the cupcakes! I made these but the cone got soggy and fell over any tips for me?? Should I bake the cones first?? How much time did it take for this to happen? I did not bake my cones first. SO cute! And I love the idea of a treat under the cone. Wish I were having people for Christmas this year. I’ll definitely keep this on file for next year. Wow, they look so good! What brand of piping tips to you recommend (preferebly not too expensive)? I would love to make these Cupcakes for a Christmas party I’m Hosting but I don’t have any piping tips at all. Ateco and wilton are both pretty reasonable. you can buy individual tips on amazon too! Made these for my father in laws dementia party! Everyone loved them. I used my own chocolate cake recipe as I wasn’t too certain on UK conversions!. I see I changed the recipe to 2lbs of confectioners sugar and did not change the metric measurement! 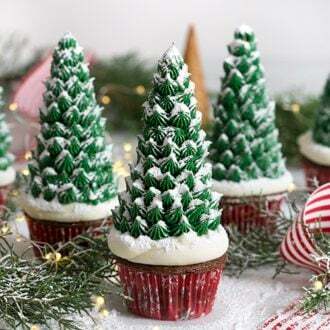 Im happy you still created these Christmas tree cupcakes! Today my daughter and I made these using the gingerbread cake recipe. All I can say is yummy it was so much fun. We are going g to do the cake for Christmas. Helloooo, I´m dying to make this cupcakes for our Christmas party at home. How much does the cones last in that position? The icing will harden a bit but the cones should be fine! My 11-year old, 2-year old, and I made these and had so much fun!!!! We play NAILED It and for the first time we really NAILED IT! Great idea and great recipe. Too bad we couldn’t share a pic!